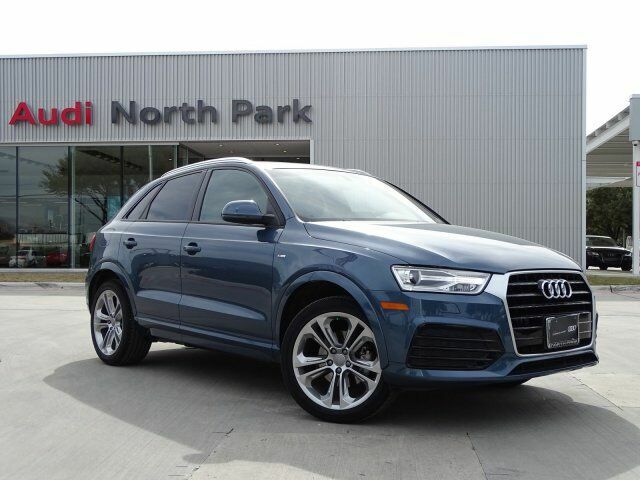 Audi Certified, CARFAX 1-Owner, ONLY 9,963 Miles! REDUCED FROM $30,995!, FUEL EFFICIENT 28 MPG Hwy/20 MPG City! Heated Leather Seats, Moonroof, Panoramic Roof, Turbo Charged, BLACK HOMELINK, CONVENIENCE PACKAGE, SPORT PACKAGE AND MORE! CONVENIENCE PACKAGE Power Tailgate, Auto-Dimming Interior Mirror w/Compass, Audi Advanced Key, keyless start and stop, entry for front doors and tailgate (sensors in front door handles and tailgate), Aluminum Satellite Inlays, SPORT PACKAGE Audi drive select w/3 driving modes, 3-Spoke Multifunction Sport Steering Wheel, flat-bottom and shift paddles, Heated Front Sport Seats, 12-way power front seats and 4-way power lumbar adjustment for driver and passenger, Wheels: 19" 5-Double-Spoke Offroad Design, Tires: 255/40R19 AS, BLACK HOMELINK. Rear Spoiler, MP3 Player, Sunroof, Privacy Glass, Steering Wheel Controls, Child Safety Locks, Electronic Stability Control. 1-year/unlimited mile Warranty Plus Balance of 4-year/50,000-mile Factory Warranty , 24-Hour Roadside Assistance , 300+ Point Inspection and Certification , No Deductible , Trip-Interruption Services Reduced from $30,995.